Friday’s Fresh Five! (5/4/12) | What about this? They’re finally here! After a seemingly long wait, the little strawberry stand down the way from my home finally reopened. Baskets overflow with big, red, ripe, juicy strawberries and customers eagerly stand in line to get some of the first-of-the-season beauties. They are just one of the reasons I love spring! #1 – Strawberry Trivia – True or False? A. Strawberries are the only fruit with the seeds on the outside. B. The average strawberry has about 200 seeds. C. Strawberries were once used as a toothpaste to clean teeth. 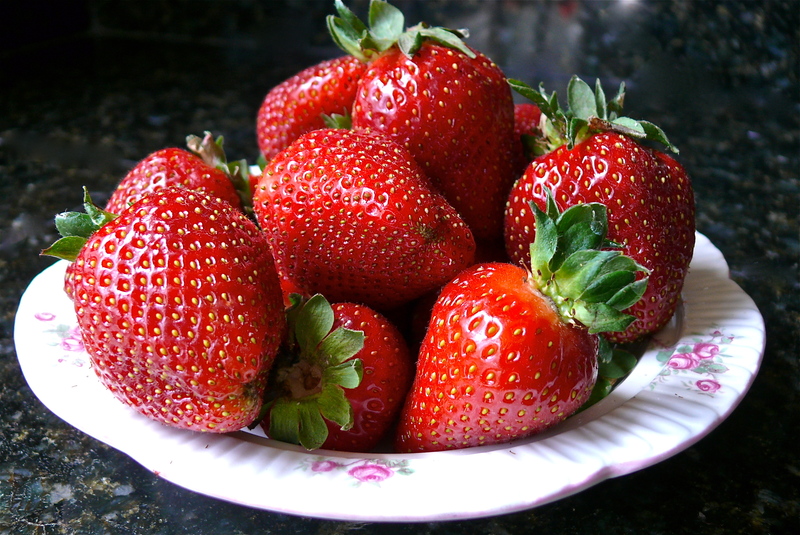 D. Strawberries are the most valuable fruit crop in the U.S.
E. Strawberries will continue to ripen once picked. F. Strawberries are part of the rose family. G. Strawberries offer more Vitamin C than any other berry. I. Strawberries are the second fruit to ripen in the spring. Answers: A (T ), B (T), C (T), D (F – strawberries are in fourth place after grapes, apples, oranges), E (F – strawberries will not ripen once picked), F (T), G (T), I (F – strawberries are the first fruit to ripen in the spring. Friday’s Fresh Five! is all about sharing, so when I came across Wall to Watch, an “online gallery of undiscovered content,” I knew I had to share it. It’s a site that presents nine interesting articles a day. Check it out and enjoy! Eating blueberries and strawberries are one of the nine things listed in the article “Boost your brain: things to do, eat and drink which could stave off Alzheimer’s.” I already feed my husband nutrient-packed strawberries and blueberries; now if I could only get him to follow tip number 2 and clean the house for his own good! Great post today Linnell! I’m going to whip up a strawberry facial this weekend. Sometimes are little strawberry stand has boxes of bruised strawberries that they sell at a discount. They would be perfect for that!